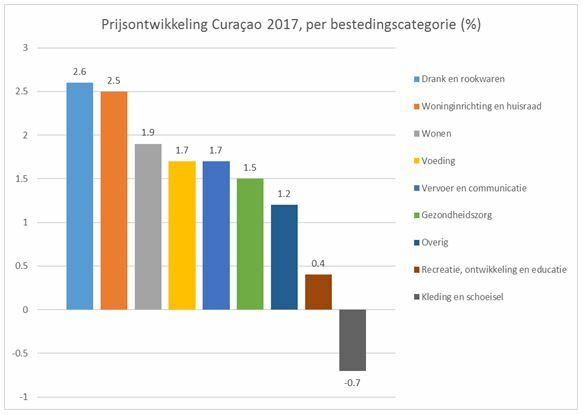 WILLEMSTAD - The consumer price index (CPI) of Curaçao increased by 0.2 percent in the month of December 2017, from 126.1 in November to 126.3 in December. The most important price changes during the past month (December 2017) are the reduction of petrol (-4%) and the cost of electricity consumption (+ 3%) and cooking gas (+ 25%). The latter price change is the most striking. A large cylinder of propane gas has risen from NAfl 40 to Nafl 50, while for a small cylinder Nafl 10 has to be added instead of Nafl 8. The old price was constant from February 2016, while the new price is equal to the level of September 2015. The CPI of December 2017 (126.3) is 1.7 percent higher than the CPI of December 2016, when a CPI of 124.2 was measured. This figure (+ 1.7%) is an indication that the consumer price level during the month of December 2017 was 1.7 percent higher than during the month of December 2016. Measured over the twelve months up to and including December 2017, compared to the same period a year earlier, prices have risen by 1.6 percent on average. The 12-month average CPI has grown from 123.5 in December 2016 to 125.5 in December 2017. The inflation rate of December 2017 (1.6%) reflects inflation for the full year 2017 and is the result of the price development of the 9 spending categories. This price development is illustrated in the graph. The inflation on Curaçao in December 2017 and the whole year 2017 is 1.6 percent. Since the inflation figure (1.6%) is an indication of the increase in the cost of living, it is recommended as an indexing tool for salaries, pensions, social benefits and other income.